These hub centric adapters are used for 5 lug 4.5" (114.3mm) bolt pattern with 70.5mm hub to fit 5 lug 4.5" (114.3mm) Ford factory wheels (70.5mm bore) with certain conditions. CNC machined 6061 T6 billet aluminum. New wheel studs and lug nuts are included. They have a snug fit on vehicle hub. The raised lip centers the following factory wheel perfectly. They are guaranteed to fit the following models with original wheels. 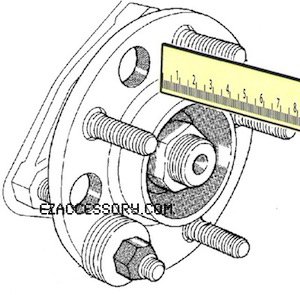 If the model and year of your vehicle is not on the list, you need to check and make sure your factory hub looks similar to diagram below and the height is no more than 20mm (see the the way to measure in the diagram below).